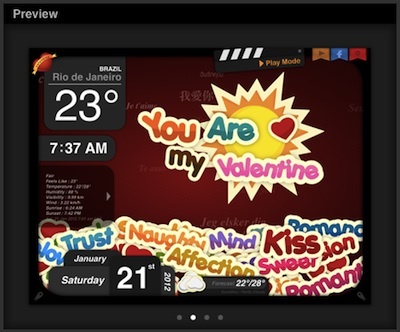 Nothing says ‘I Love You’ like a Valentines iPad Weather App! We were kidding with our post title… well, sort of. Maybe, if that special person in your life, this might be a great gift idea that keeps giving long after the Valentine Day celebrations. First, the core app is Better Weather. 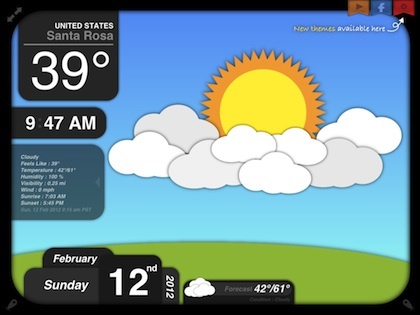 A graphical weather app for the iPad. We have covered it before, the app shows an image of the sun/moon with the weather traveling through the sky. Clouds move along on windy days, rain comes down, etc… Also on the screen is the temperature, time, forecast and date. If you already (or the person your giving the gift to) have Better Weather loaded on the iPad, visit the ‘Themes’ area to upgrade the graphics to a special Valentines look. 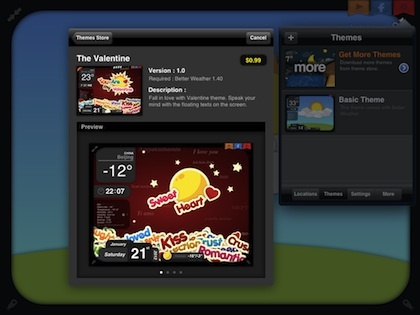 If you don’t have Better Weather loaded, you can download the special Valentines version directly. The app still shows weather, local and multiple other locations, but with a special feeling included.